This post is slightly all over the place with odds and ends from the week, but that’s about where I am after a busy week. Thank goodness the weekend is here and I just booked a week long vacation for us in July, I already feel relaxed and can’t wait! Finding good vegan shoes for me is an issue with my foot size, many of the nice eco friendly brands just do not go up to my size. It’s even more of a challenge that I need decent looking business casual shoes for my job. But I’m finding that I could live in flip flops when I’m not at work, especially in the triple-digit heat days of the summer. So I have a nice collection of vegan flip flops in various colors and styles. 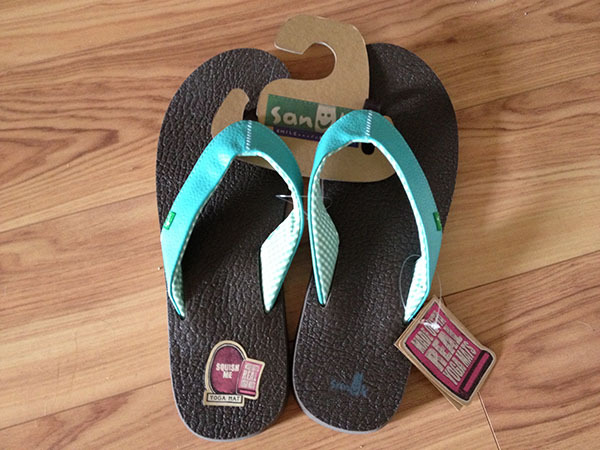 My latest addition is these Sanuk Yoga Mat sandals. And my first pair ever of Sanuks, but clearly I need to change that since they’re so comfortable! The soul is made out of squishy yoga mat that breathes nicely and the textured material makes them more stylish for khaki shorts. I’ve been slowly adding more kale to our garden for the summer both in the garden beds and available pots on the patio to have mass amounts for smoothies and kale chips. Miko recently discovered the pots for snacking and has been helping himself. That’s okay, can’t be mad at him for eating healthy and thinking I need to work on a dog treat kale chip recipe this summer. 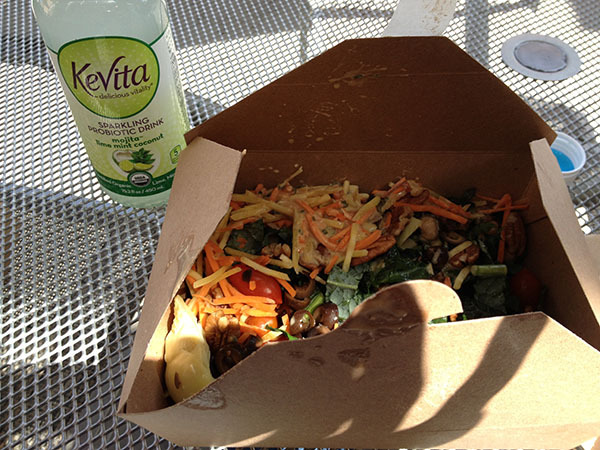 I ran to Whole Foods for lunch yesterday to pick up a few things and hit the salad bar. The Mojita KeVita drink was a new experience and took me back to fun nights in South Beach with a strong minty flavor and zing, would drink again. I also saw a Tesla Model S drive by which was a geeky awesome thing since they’re rare, fabulous, and I’m slightly obsessed with electric cars now and would have one if I ever won the lottery. For now, I’ll be happy with my Honda EV for the next few years, but who knows what will be available when the lease is up! Hubby and I stepped out for Thai again last night, I didn’t feel like cooking and this local place has great food for a great price. 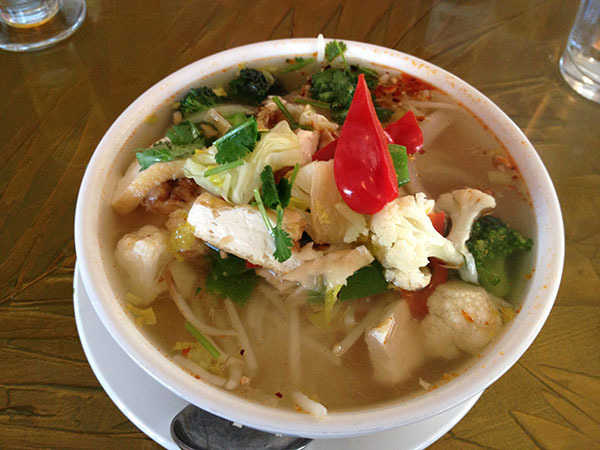 This time I went with a spicy tofu veggie noodle soup and it was wonderful with plenty of fresh cilantro. 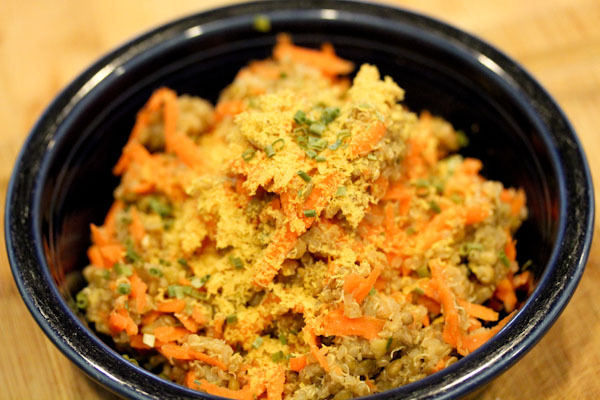 Finally I created another lentil and quinoa recipe over the week. I’m a fan of cooking lentils and quinoa together because they have similar cook times and liquid ratios and complimenting textures. 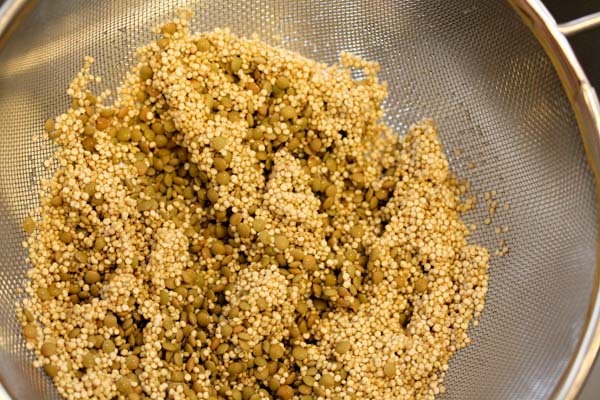 Rinse the lentils and quinoa in a mesh strainer. 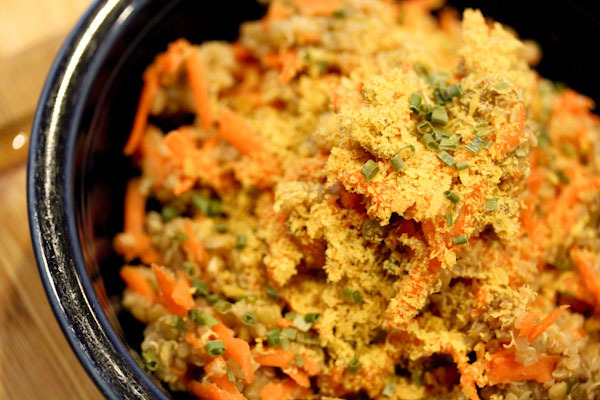 Bring lentils, quinoa, and water to a boil in a medium soup pot over medium-high heat. Reduce heat to a simmer and stir in miso, ginger, paprika, and garlic. Cover and simmer for about 20 minutes, until quinoa is fluffy and lentils soft. 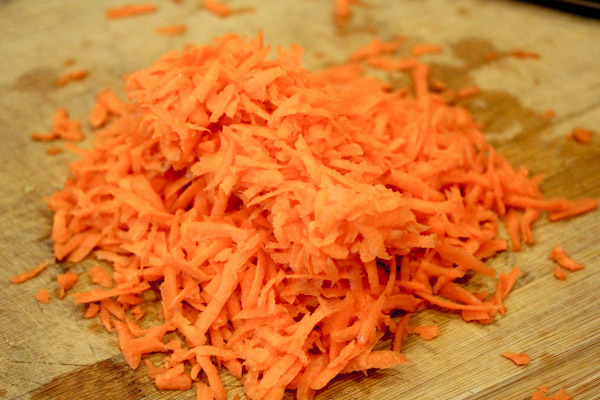 Remove from heat and stir in shredded carrots. 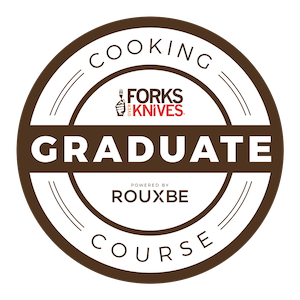 Serve and enjoy, makes 2 large main servings or 4 side servings. 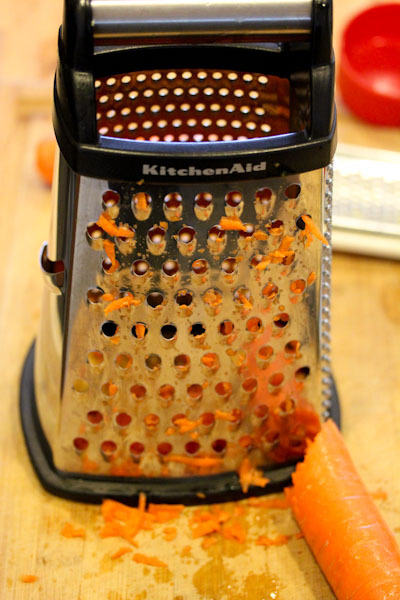 I used to cheese grater to grate the carrots, fast and simple for small jobs. And I topped my serving with nutritional yeast and dried chives for a little added spice and texture. Adding the shredded carrots raw to the cooked mixture kept them nice and crunchy while cooling the mixture down to an “eatable” temp, but still keeping it hot. The miso, ginger, and garlic flavors cooked into this dish were absorbed well by the lentils and quinoa and it made a hearty vegan main dish. You will love those sandals! I have two pairs of them! Just make sure not to get them wet…they don’t dry easily…and won’t smell great! Haha! Thanks for the info, I will keep that in mind when I pack them for our vacation. 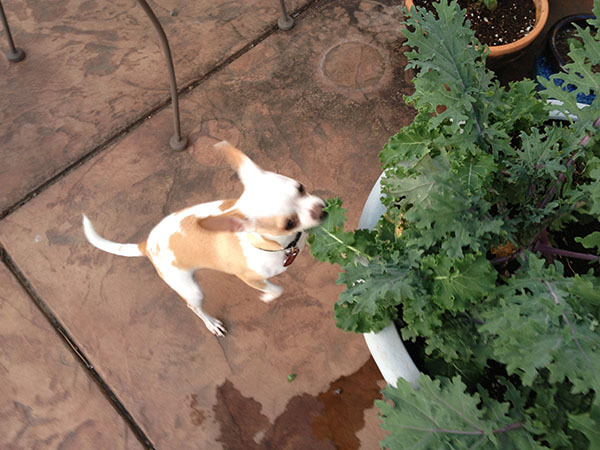 Oh Miko is way too cute jumping for kale! Miko eats a lot of fruits and veggies, I just discovered he adores bananas too and they’re good for dogs. My other chihuahua is a lot more picky though, I’ve been trying to convert her to a plant based diet and it’s been very slow! I’m making this right now…smells good! I am doing it in my rice cooker, we’ll see how it goes. Thanks! Very interesting in a rice cooker, I’ve been thinking about getting one. Thank you for the recipe! I’m going to play around with the ingredients seeing that I don’t have everything currently on the list. On another note, alternativeoutfitters & mooshoes (.com for both) are great stores for vegan option footware and more. Good luck!